The company set up to manage the government's holdings in banks has criticised the size of former RBS chief Sir Fred Goodwin's pension. UK Financial Investments (UKFI) blamed the Royal Bank of Scotland board for deciding to give its former boss a discretionary pension. 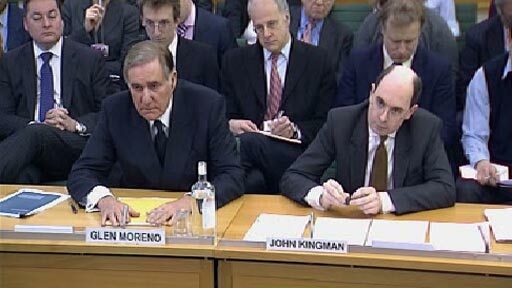 UKFI chief executive John Kingman and acting chairman Glen Moreno were being questioned by the Treasury Committee. Mr Moreno said he regarded Sir Fred's pension as "reward for failure". He said: "I think it was wrong. I don't think the remuneration committee or the board of RBS should have effectively increased, doubled I guess, a pension benefit in that situation." Sir Fred was awarded a pension worth a total of £16m. Mr Moreno also criticised Sir Fred's behaviour at RBS. "If I were [Sir] Fred, I would have walked," he told MPs. Described by those who know him as "self-effacing but self-confident"
Can they catch Sir Fred's pension? Mr Kingman said that the government was aware of the size of the pension pot, but added that "what the government was not told was that this payment was in any way discretionary". "Our view is that criticism should be redirected at those who took the decision," he said. "The decision was clearly taken by RBS." He accused the RBS board of not sharing material facts with Financial Services Secretary Lord Myners. He said: "I don't think one can expect Lord Myners to know the finer details of the RBS pension scheme." He stressed that RBS could have terminated Sir Fred's contract with 12 months' notice. "Plainly the cost of that would have been a good deal less than the pension outcome that we now know followed," he said. Mr Kingman told the committee that UKFI was investigating whether RBS had "full knowledge of the alternatives" when it granted Sir Fred his pension. Mr Kingman refused to be drawn on how long he thought it would be until UKFI could withdraw from RBS. However, he hinted that it could be longer than RBS chief executive Stephen Hester had hoped for. 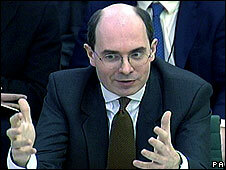 Mr Hester told the Treasury Committee last month that he aimed to turn the bank around in three to five years. But Mr Kingman said: "He [Mr Hester] sees that as the timescale for the full turnaround of the bank. I think that's not necessarily the same thing as the timescale for our exit." UKFI was set up by the government in November last year, in order to manage the holdings of banks it took stakes in. Its job is to maximise value for taxpayers. It holds the state's shares in RBS and Lloyds. It does not currently hold the government's stakes in Northern Rock or Bradford & Bingley, although the government has stated its intention for UKFI to do so "in due course". Mr Moreno was appointed acting chairman of UKFI when Sir Philip Hampton left to take over as chairman of Royal Bank of Scotland. The Treasury Committee is continuing to investigate the banking crisis. 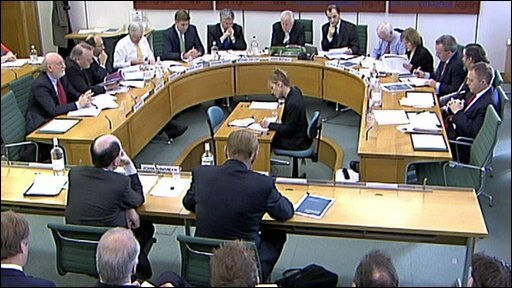 In the opening exchanges of the hearing, Mr Kingman and Mr Moreno had been rebuked by MPs for turning up unprepared. Committee chairman John McFall said it was "scandalous" that they did not provide information on senior bankers' pay. Mr McFall said that the information had been asked for on Friday.